Clarins Lift Fermete Cr. Riche Regen. NAME: Clarins Lift Fermete Cr. Riche Regen. Clarins Lift Fermete Cr. Riche Regen. 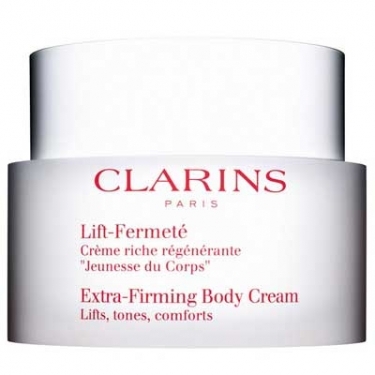 (Extra-Firming Body Cream) is a firming body cream to fights away sagging skin and restores youthful-looking contours. Contains lemon thyme extract to protect skin's elasticity and bocoa extract and Asian centella to boost collagen synthesis. Offers supple hydration and moisture thanks to the action of Shea butter and jojoba oil. Use morning and/or evening, focusing on thighs, abdomen, bust and inner arms.